Our product supports you in the collection of social networks via online survey, visualization of social network structures and data analysis. Collect the relationship structures of a company, organization or other groups with the help of an online social network survey. In contrast to conventional online survey tools, our solution not only allows you to collect data about respondents but also the relationships between the respondents or other groups. We relieve you of the burden of compiling and carrying out your online surveys. Send us your draft questionnaire (e. g. as pdf-file). We create the appropriate online questionnaire and put it online. During the survey you will always have access to the survey data. At the end of the survey phase, all survey data is available. Which persons are the central actors? Who is the most important source of information? Who cooperates with whom and to what extent? Who is isolated in a group? All employees receive a personal email. Employees can select other employees from a list. Different forms of relationships (e. g. cooperation, help, conflict, etc.) can be queried. Cultural operators are invited to a city by email. You can use a list to specify whether you are cooperating with other actors and how exactly this cooperation will look like. Additionally, other actors that are not yet included in the list can be specified. 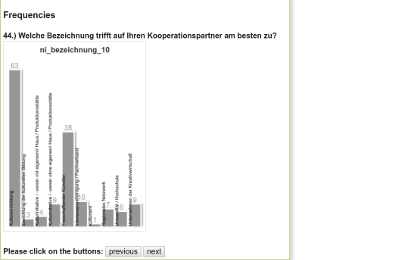 During the survey, you always have an overview of the current dataset. Participants who have not yet completed the survey can be personally reminded by email. After the survey has been completed, you will have all data available. We can develop additional functions for your individual needs. In which situations can you use our tool?